What can I say? Sometimes the end of Summer and the beginning of Fall go by in a blur and you are too busy having fun or trying to keep up to write it down, much less blog about it. Since my last post, I was in a car wreck. Sitting at a red light, hit from behind. So scary. I hadn't been in any kind of accident in almost 30 years. 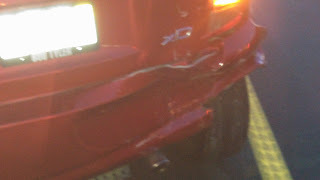 Totaled my car. 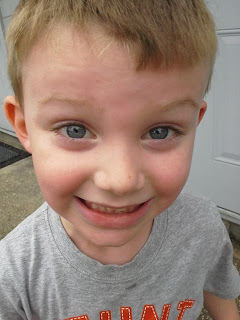 I cried for half an hour, and waited 2 1/2 hours for the Highway Patrol to show up. But it has turned out to be a blessing, believe it or not. And I was on my way home from a job interview. Like I wasn't stressed already, looking for work again. We celebrated my grandmother's 94th birthday. She is so healthy, she may outlive us all. 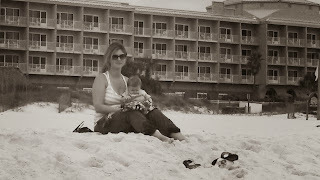 My aunt flew in from California to celebrate with us and we had a blast visiting Fairhope, AL and being girls. By ourselves. Its rare. 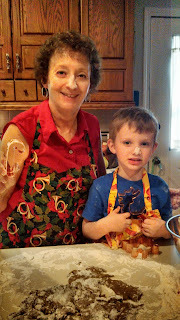 We made cookies from a recipe that came from my great grandmother. How many 4 year olds can say they made their great, great, great grandmother's Molasses cookie recipe with Nana and Great Gramma Lana? Tyler can! He had recently pulled open a drawer in the kitchen to rediscover my collection of large, shiny, copper cookie cutters, and said with big, hopeful eyes "Are these cookie cutters? Can we make cookies with these?" Of course I said yes! These are old school cookies that are more like biscuits (lacking flavor) and were meant to be dunked in coffee, which I don't drink. The original recipe called for a certain number of cranks of flour - which refers to a Hoosier cabinet flour dispenser. Thankfully my late great aunt had figured out the ratio of flour in cups for us to use when we don't have a Hoosier cabinet around. This is Tyler and my mom having a bit of fun with the flour. I chopped off my long hair! And I had highlights put back. If you have really long hair, but you always clip it up and are hot all the time, why do that to yourself? That's what I figured. And who knows, it might help me look more professional? Look how big Lily is getting. She's trying to talk and sit up and teeth already! At 3 months. And Tyler just lights her up! He has that affect on everyone. But she is going to be his shadow, I can tell. And we all look forward to what a good, close relationship they will have all their lives. Since cooler weather comes and goes, we've been back to the park, the beach, and sleeping with the windows open at night. That is a treat that most people take for granted. Not here. It is like Christmas! Every time I look at this picture of the Little Fish getting to be in the water again, I hear that gospel song "Oh Happy Day!" in my head. Ha! He ran in with his clothes on. We were going to just walk and look for shells, but you know a fish can't stay out of water. 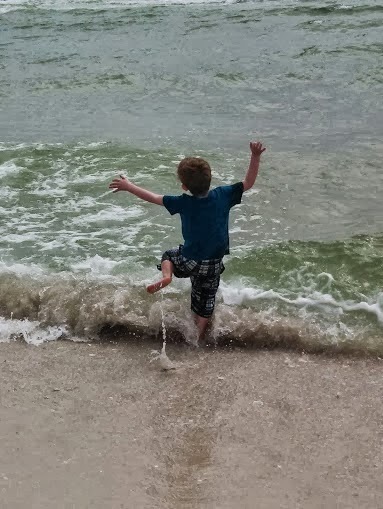 And when the Gulf is still 80 degrees in October, well who wouldn't want to get wet? So we all got a bit soaked and later dried off over lunch at the local Cactus Flower restaurant. Best Mexican food in the county. Maybe in the whole state. And we have 3 to go to! It was Lily's first time at the beach. She didn't scream or cry at the water touching her feet, so she is probably part fish too. 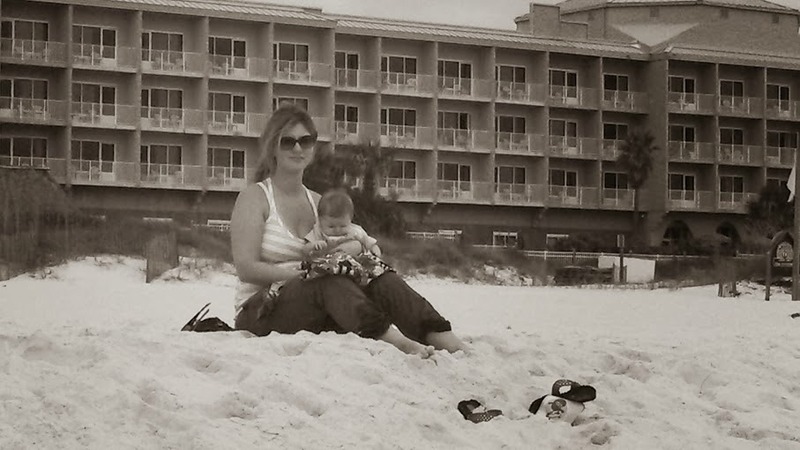 Lily and her Mama watching the waves. I really have to tell you that I am letting myself enjoy this break in employment. The car accident has provided a little breathing room financially, so even though it is really tough to get an interview, I take advantage of the weather and the free schedule I have to make the most of my family and our proximity. What else? I continue to work on my own quilt designs so that maybe I'll have enough for a book someday. Can't show you those, but I can show you a scrap buster that is from a Pinterest pin I found. All these tiny 1 3/4 inch HSTs are the trimmings from the Bali Sea Star quilt I made a few years ago. I started throwing all my corner trimmed HSTs into a bin, and when I see something they could be useful in, I take them out and play with the idea. I have painted my tiny bathroom 3 times. 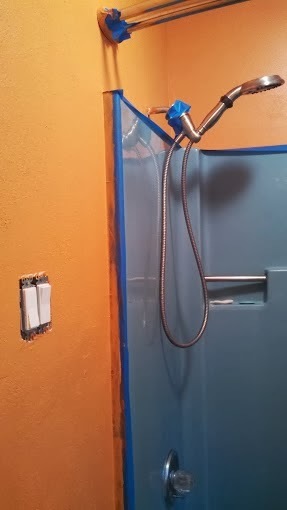 I got it in my head that orange might counteract the ugly blue shower walls and toilet color. I tried 2 different shades, but after 2 weeks of looking at it, I hated it. So now it is a nice light blue called "Tropical Surf." I no longer feel like I am peeing in a cantina bathroom. The blue tape in the middle picture is a nice touch, isn't it? 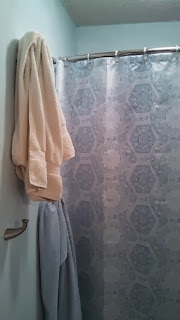 See what I mean about the hideous shower color? Ick. But I am not shy about using color in my house! You have to give me that! Right? Summer won't really be over here until about Halloween, but I have lived in the South long enough now to see the signs that it is wrapping up. Afternoons don't have the punch of heat like they used to. I can actually get out and walk without looking like I've been swimming. Ick. Sweat. Not my favorite thing. There is that afternoon breeze that whispers, "Fall is almost here! Yeah!" 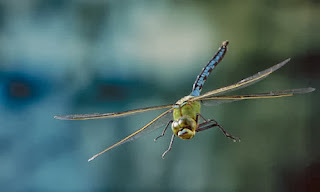 Dragonflies start showing up in groups. I don't know if they are mating or just hanging out enjoying the fine weather, but you usually see them alone earlier in Summer. This is the Emperor Dragonfly. He's big and beautiful. About the length of my hand, going by the last one I found (who had expired in the pool.) We found a baby dragonfly (also expired) but have no idea which kind he might have grown up to be. 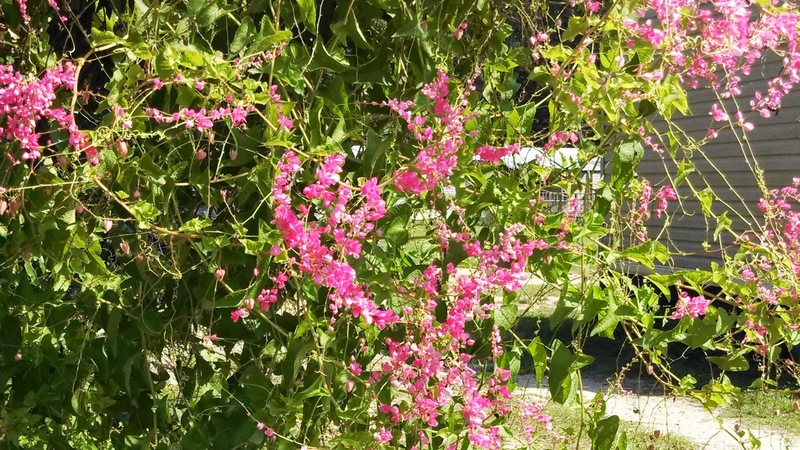 a beautiful, delicate vine, but it grows fast and will soon be covering up fences and pastures, so I understand why a farmer might not like it so much. 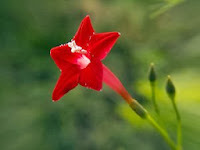 It is Cypress Vine. Similar to Cardinal Climber, but different leaves. The leaves on Cypress Vine are fern like and the flowers are about the size of dimes, and the deepest scarlet. Little star shapes. I adore them. The Showy Rattlebox should be showing up soon along road sides and in culverts. I had to look it up under Northwest Florida Wild Flowers. It gets very tall, like Hollyhocks, and the flowers remind me of Snapdragons. 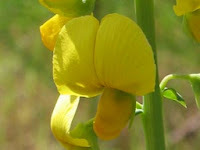 The flowers drop and they are replaced by pea pod-looking things. Seeds in a package, I suppose. Someday I am going to figure out how to get these pics to line up side by side. Last of all, and most people dread them, the Love Bugs. 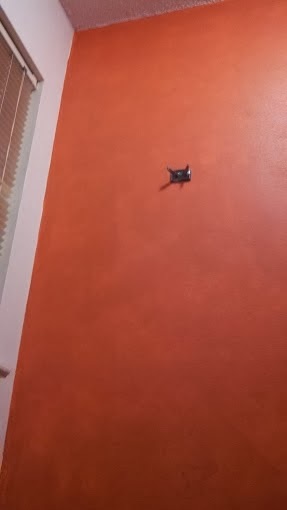 Little black things with orange heads. Attached to each other at the rear, hence the name. Swarming harmlessly all over your car at red lights. Not getting out of the way when you are driving. A local saying is that the only natural enemy of the love bug is the grill of a vehicle. It can be frustrating. But it is great for business at the car washes! I'll spare you the pictures of that. I am working on quilting two Halloween quilts I have made for the grandbabies. 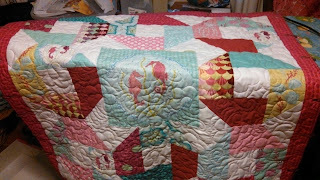 I will show pics of them as soon as they are quilted and bound. Hopefully before too long. Halloween candy and costumes are already in the stores. Another sign that Summer is almost over!! It's here! The magazine I have waited 2 years for. Quilts and More Fall 2013 with my quilt in it! I found my copies at JoAnn. 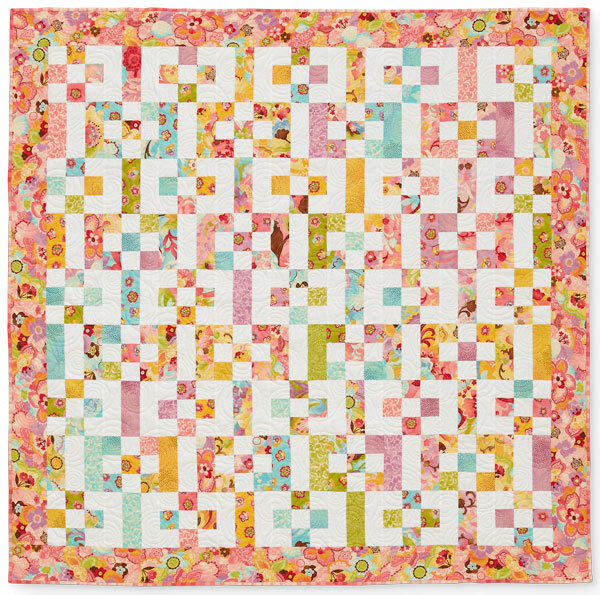 "Add It Up" is a jelly roll quilt of my own design. Beautifully quilted by Nancy Troyer, long arm quilter and former Pensacola resident. I am going to have to mail my quilts to Kansas from now on!!! The magazine chose this name, which is fine. Its part of the process. I originally wanted to call it "Tesla" because of the positive and negative images the blocks create. (I may still call it Tesla when no one is around.) There is probably some copyright issue with that name, so I didn't suggest it to them. Have you designed a quilt? You can submit your ideas and photos to magazines, you know. You could be published too. Don't be shy! Show the world how creative you are. I have not decided what to do with this quilt yet. I give away quite a few of my creations, but I think I am definitely hanging on to this one. Who knows? I may be a quilt teacher someday. I'd like to be able to show this one in person. Not the greatest quilt photography here, but this is another recent creation. 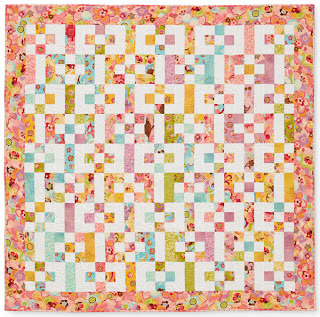 It is the first quilt for my new granddaughter, Lily. Most of the fabrics are from the Full Moon Lagoon line, but they blended really well with some leftover Parisville pieces, and some others in my stash. The more, the merrier. The blocks are based on ones I've seen by Kate Spain and Carrie Nelson. 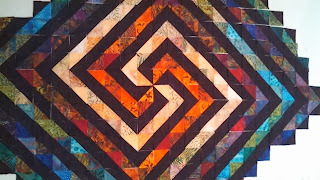 Again, quilted by Nancy Troyer. 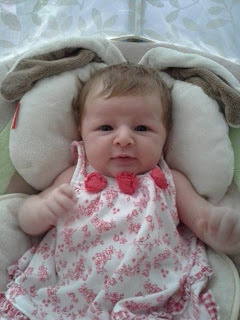 Who also has a new granddaughter, Grace. I'm waiting to see what she's made for the newest member of her family. Quilts don't have to have tiny pieces, or complex design. They can be large blocks, one block, two colors only, whatever you want. Step up to your design wall and start making something that YOU like. You never know where it might take you! Hello, people! It has been a long while, hasn't it? Life gets so busy. Sometimes you just have to give up things for a time. Like blogging. And reading blogs. But I have not stopped making quilts and other sewing projects. 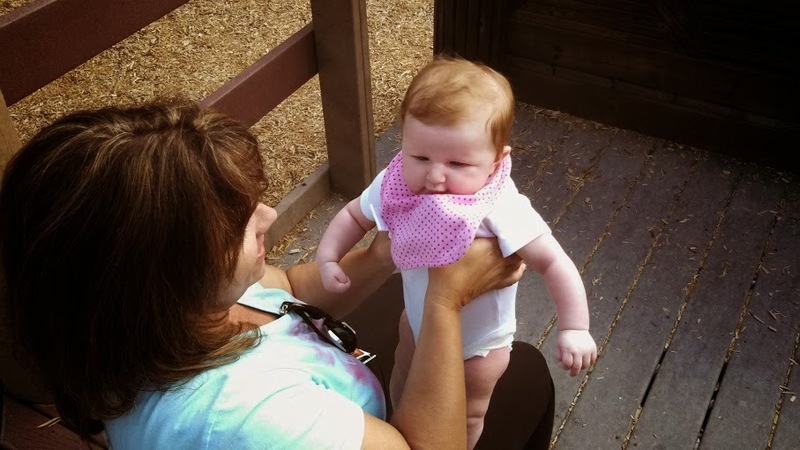 And I sure have not stopped being a Nana. I have lots of news, but first up is the announcement that I have a quilt being published in the next issue of Quilts and More magazine!!! The Fall/Winter issue! I am SO excited. This is the cover, so you know what to look for at the store. 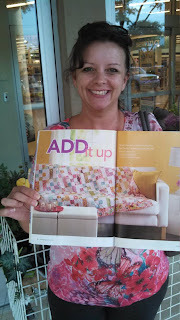 And below is my quilt, "Add It Up." 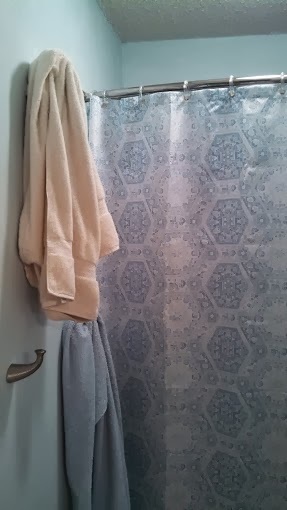 I used a jelly roll of the Coquette fabric line by Chez Moi, and Bella solid in white. I made the original version of this quilt more than 2 years ago. And it is one of those happy accident stories. I made some Nine Patch and Rail Fence blocks, got distracted, and then a few weeks later I got back to making them again, but without looking at the completed blocks. I had reversed the color order! I played around with the layout of the 2 sets of two blocks and this is what I designed. Do you see a positive and negative image in the arrangement? Fun, huh? This design would be a great way to use up those 2 1/2" scrap strips that you have leftover. These colors are very feminine, but I could easily see this in Christmas fabrics, or manly colors - maybe with a dark solid instead. I hope you will check your quilt shop or book store for this issue. 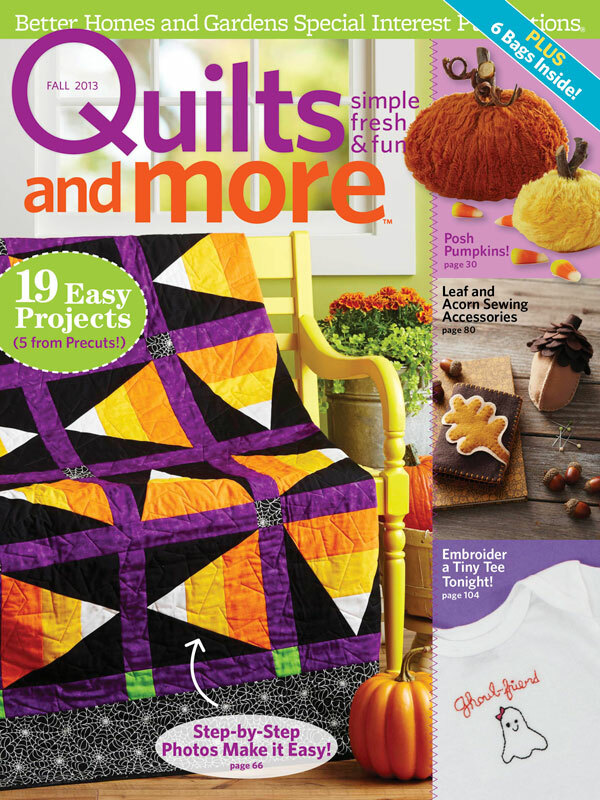 There are always so many fun projects in every issue of Quilts and More, you are sure to be inspired. I'll be back soon to catch you up on my life this past year. Pink Chalk Fabrics blog is having a Where I Sew Month, and I thought, why not? You can see my unconventional space. Maybe you'll get some ideas, or give me some! Once upon a time, I had an actual room with a door to sew in, but then we were blessed with a wonderful grandson (who lives with us) and I gave up my sewing room for him to have his own space. Now I sew in what you might call the front parlor. Just inside the front door to our home. It has very large door ways that lead thru to the dining room, and when I am working on a big project, I close off the access to the dining room with the design walls. The lighting is not the greatest, but I make do, and I get a lot done in here. This giant table on the right is an old architect's desk. Technically it is an engineer's former desk, given to me by my boss when everything went electronic. I had been dreaming of an elevated surface to cut fabrics on without straining my neck, and can you believe he gave me this for free? I looked these up on Ebay and almost fainted. 1/3 of the top is butcher block - which my Janome sits on - and there are 2 huge drawers underneath. I am lucky to have it. The gray floor mat under the chair? From Sam's Club. Super comfortable to stand on for hours. Easy to move around when you need to. I highly recommend these. We even used them for wall to wall flooring in Tyler's room. Believe me, Nana and Papa have a much easier time playing on the floor with Tyler now that these foam pads are installed! You can see the design walls and my current project, the Great Granny Along, closing off access to the dining room. There is a great tutorial there for this super easy and rewarding quilt along. Join in! These design walls are easy and inexpensive to make. Insulating foam boards from your local home improvement store, spray on adhesive and some very inexpensive diaper flannel. And they weigh only ounces, so you can move them all around easily. There are 4 sets of white cubicle cubbies that hold my quilting magazine collection, patterns, fabrics, notebooks, printouts and some WIPs and UFOs as well. I have a homemade bulletin board behind my sewing machine for inspirations and plans and tips. I'd like to tell you that this is all of my stash, but who are we kidding? This picture was taken over a year ago, so yes, this set of cubbies is overflowing. Packed to the gills. And not this neat. The rest of my stash still takes up one of the 2 closets in Tyler's room, 6 totes and several boxes that are crammed here and there and everywhere. Tyler recently asked me why my fabric lives in his closet? He didn't understand that his room was something else before he was here, but he accepted the explanation anyway. If you are sewing at your dining room table, which I have done before, make it your special space. Even if it is only for an hour or two. And have fun!